Integrate mylyn support into OSATE. Step 1: need to add the mylyn features to the OSATE build. Added mylyn to the OSATE2 setup. Still hunting for good mylyn developer documents. So far I know that I need to create a Bridge for OSATE. Haven't figured out much beyond that. Mylyn plug-ins don't seem to include the source code. I have resorted to importing the source code from the Eclipse GIT repository. Instructions for this are found here: https://wiki.eclipse.org/Mylyn/Contributor_Reference#Setting_Up It's a bit of a chore, but I did finally get it to work. For the versions of Mylyn and Gerrit that are current today, installing using Gerrit doesn't work, and you must install using GIT. You need to use your Eclipse.org-generated username to authenticate. The main bridge component for the JDT is JavaStructureBridge. I'm going to try to study this and it's ancestor classes to figure out how mylyn works. JavaUiBridge is the UI bridge component for Java. 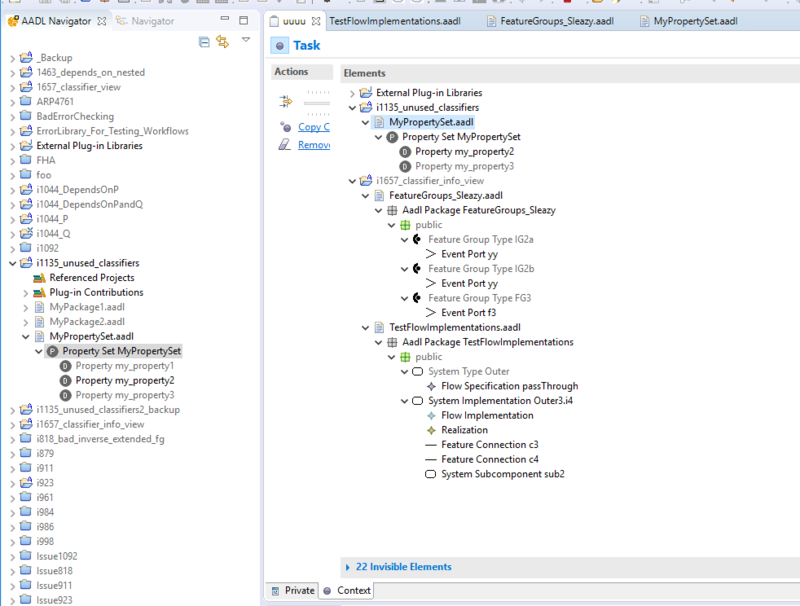 Extension points are org.eclipse.mylyn.context.core.bridges and org.eclipse.mylyn.context.ui.bridges. Cannot find real documentation on how to use these. Therre is not a lot of Javadoc on the AbstractStructureBridge, but it seems pretty easy. The main job is to turn model elements from the workspace into unique keys or handles as they call them. Also indicates which ones can be opened by an editor (are documents). Been looking at the JavaStructureBridge and the ResourceStructureBridde. Not sure what the minimum required set of features is for mylyn. We initially just added org.eclipse.mylyn.context_feature to the build, but I had to add org.eclipse.mylyn.context_feature to the build target today. Once I did this my AadlStructureBridge started to activate. Doensn't seem to do anything yet, but at least it is finally activating. I should note that I have created a new plugin project org.osate.mylyn.aadl.ui in core. I created AadlStructureBridge over the last few days. It's pretty simple, but I had to make some changes based on observed behavior. Been using the debugger a lot to try and figure out when and why the different methods are called. Got things so they dont' crash, and I have the bridge a child of the resource bridge (as is the Java bridge). But, I'm still not seeing any AADL elements added to the context. I was hoping that just the structure bridge would be enough to see this, but I guess not. I am now creating AadlUiBridge. I have a minimal skeleton implementation. I plan on using the debugger again to try and understand what is going on. Adding a UI Bridge doesn't build the context either. The interaction monitor converts selected elements into handles. This does seem to cause items to be added to the task context. But so far the AADL elements are added as :"invisiible" elements. They aren't but in the tree in the task context display. Not sure what is going on . I have verified that parents can be resolved all the way up to the project. Going to search the mylyn source code for "invisible" to see if I can find out how a handle is classified as such. Added org.eclipse.mylyn_feature and org.eclipse.mylyn.context_feature to the OSATE2 modular target in the osate2_2018-12.setup file. See org.osate.ui.utils.SelectionHelper for use of EObjectAtOffsetHelper to get object from text location. Added handling of TextSelection to the AadlEditingMonitor. Appears to have had the desired effect, as elements are added to the context. Unfortunately, the navitator extensions previosuly added for AADL do not handle features, subcompnents, etc. Unclear yet if I should create an additional navitor extension or make the existing ones more general. Need to figure out how to get the mylyn icon in the AADL Navigator toolbar that appears in the Java Navigator toolbar. Here is a screen shot of AADL elements in a Mylyn task context. Elements in Plug-in Contributions are not showing up in the context tree, only as "invisibile" elements. I have to check on this. I though I added the proper navigator extensions. Problem is that I need to link the contributed files to the Plug-in Contribution node. This needs to be done in AadlStructureBridge.getParentHandle() I think. I can differentiate between handle sthat start with platform:/resource and platform:/plugin. Okay, I think the solution is to create a new navigator content provider that lists the contributed content at top level. Upon discussion with Lutz we have decided that it is okay for "contributed" items to be invisible. They are not editable. It's too much of a hassle to update the structure builder to deal with them. Last week I implemented AadlUiBridge.openEditor. That was straightforward to do. I have breakpoints in all the other ui bridge methods, and they never get called. This seems fishy and there must be something else I need to be doing. I need to add a listener to the Aadl Xtext model that updates the mylyn model I think. Pretty much confirms what I already figured out. not sure I need to add a listener to the AADL model. I though this was necessary to deal with edits to the files and to update the context. But just playing with the files in Eclipse, this doesn't seem necessary. Mylyn does the right thing. Still have no idea what needs to be done to make the AadlUiBridge methods relevant. Going to stop worrying about that for now and turn to the "task focused" navigator problem. Just realized the "Outline" view does have a "Focus on Active Task" action button by default. Clicking on this causes the acceptsEditor method of the UI bridge to be called. Implementing acceptsEditor to test for XtextEditors whose editor input is a file ending in .aadl makes pogress. Next step is a call to getContentOutlineViewers. This is fine. But now the problem is that the Aadl2OutlinePage deals in EObjectNode not AObject. Dealing with EObjectNode objects is easy because they have a getEObjectURI method. It was easy to update AadlStructureBridge to accept then and return the URI as the handle. Doing this made the task-focusing work on the AADL outline view. For the AADL Navigator I think I need to subclass FocusCommonNavigatorAction action. Following the example of FocusProjectExplorerAction. Added FocusAadlNavigatorAction to the aadl navigator. This class is just a copy of FocusProjectExplorerAction. It works. Still have mystery methods in the UI Bridge that I don't know what they should do, and I'm not sure when they are called. I've been trying to figure out when close, getElement, and getObjectForTextSelection are called on the ui bridge. I have the Mylyn source code (or most of it anyway) loaded in a separate workspace. Doing a call hierarchy on getElement shows that it is never called. The JavaUiBridge and ResourceUiBridge have non-trivial implementations of this method. But other bridges, such as Ant and PDE, just return null. I think it is safe to just leave our implementation returning null. The methods close and getObjectForTextSelection are called from single locations each. It took a while to figure out how to get anything to happen with them. Eventually I figured out that it depends on Mylyn preferences settings in the workspace. As far as I can tell, they won't ever be called if Remove file from context when editor is closed is unchecked (the default situation). I have been able to observe them being called when this setting is selected. I need to study the situation more. Of note, however, is that while getObjectForTextSelection has a TextSelection parameter, that paramter is only ever passed null. Again, as of March 2019, getObjectForTextSelection is only ever called with the selection parameter passed the value null. It is also true that it is safe to return null here, as that is what the Ant and PDE bridges do. I think this method is supposed to take the current text selection and turn it into an object whose structural handle can be retrieved by the caller. When the selection is null it is supposed to return the object represented by the top-level of the editor. However, returning null causes the caller to get the structural handle of the IResource being edited by the given editor. Again, considering that this method is only ever called with null, there doesn't seem to be any reason to return anything but null. It won't make a big difference if the object used the caller is the resource or the package/property set contained in the resource. Punchline: Leaving getObjectForTextSelection returning null. The close method is supposed be called when an element is removed from the context or otherwise becomes "uninteresting". That is, the editor containing the uninteresting element is closed. Makes sense. But I don't know how to remove an element otherwise than from the editor. This method doesn't seem to be called unless the Remove file from context when editor is closed workspace preference is selected. And even then, so far I have only been able to make it get called by closing an editor, and then it comes back and tells me to close that same editor. That seems pretty silly. My implementation right now does nothing. The editor is closed regardless because of the original closing of the editor. The Java elements and Resource elements in the Task Context view have a "remove from context" action in the context menu. This is missing for AADL elements. THere must be an action in the Navigator Viewer setup that I am missing for the AADL navigator. So I just need to add this to the plugin.xml but attach it to org.osate.aadl2.Element objects. The remove from context command appears in the context menu and works as expected. Even better, removing all the context elements in a file will cause the mysterious close method to be called in the UI bridge. Implemented the close method. This only is ever useful when a package or property set object is removed from a context. Getting two "remove from context commands on IFile objects in the workspace. One comes from the mylyn resource plug-in. The other comes from the AADL plug-in. I think it's because we are processing IFile objects as adaptable to Element objects. Need to make sure only one command (preferably the one from resources) shows up. Put the AADL mylyn documentation in it's own section, not in the getting started document. The docs should be part of the org.osate.mylyn.aadl.ui plug-in. See the org.osate.analysis.architecture plug-in for how to have the markdown converted to html during the build process. Easily fixed by setting the adaptable attribute of objectContribution to false. Added help section. Should have the HTML auto-generated from the markdown during the build.